14k Gold Diamond Art Deco necklace. This necklace is available in a 16 or 18 inch length. 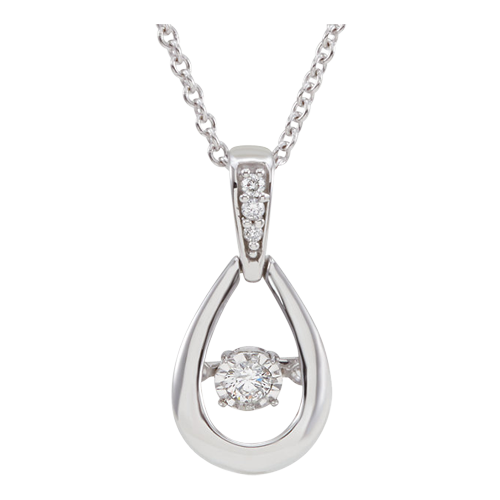 Diamonds total 1/5ctw in this design and the pendant measures 14.71mm by 15.3mm. 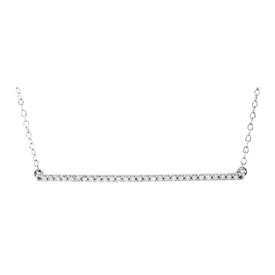 Diamond necklace is available in 14k White, Yellow, or Rose gold. 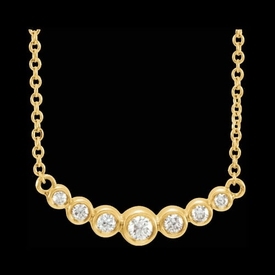 Pretty 14k gold and diamond circle necklace. Diamonds total 1/5 carat in this design and I1 clarity, G-H color. Circle measures 18mm. Available in 14k yellow, white, or rose gold. A fun diamond necklace. 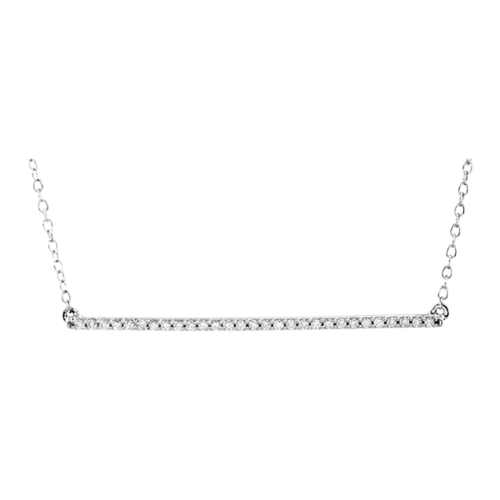 Beautiful 14k Gold Diamond bar necklace. Simple trendy design is available in 14k Yellow, White, or Rose gold. Diamonds total 1/3 ctw or larger 1/2 ctw. Bar measures 40.8mm long and necklace is 16" with a 2 " extension. 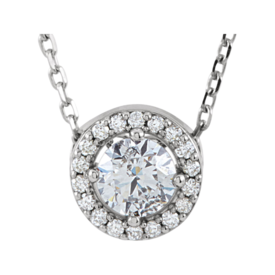 Great diamond necklace to wear anytime. 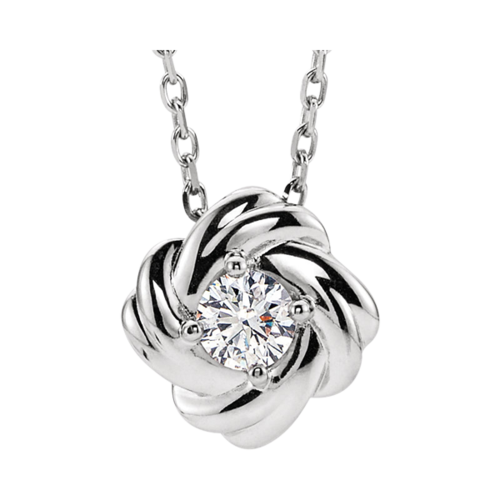 Exciting 14k White gold motion diamond necklace. 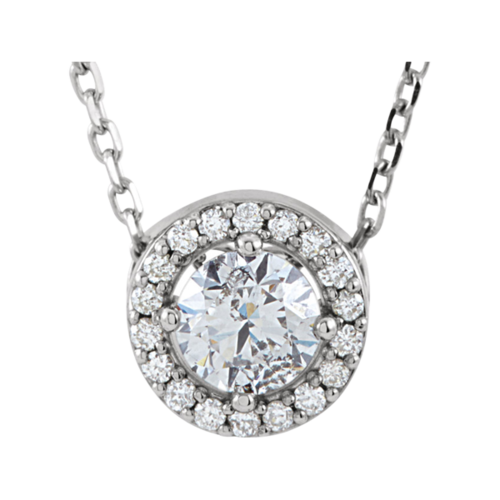 Beautiful 3/8ctw diamond necklace features a 1/4ct round center diamond with 1/8ctw accent diamonds. 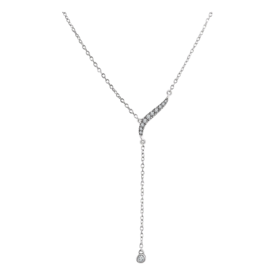 Diamond necklace measures 16-18 inches in length. The center diamond shimmers with the slightest movement. A flashy necklace you're going to Love. 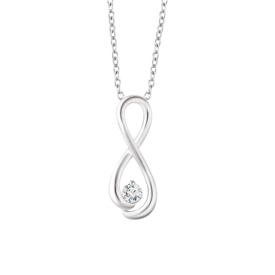 14k gold Diamond Knot necklace. 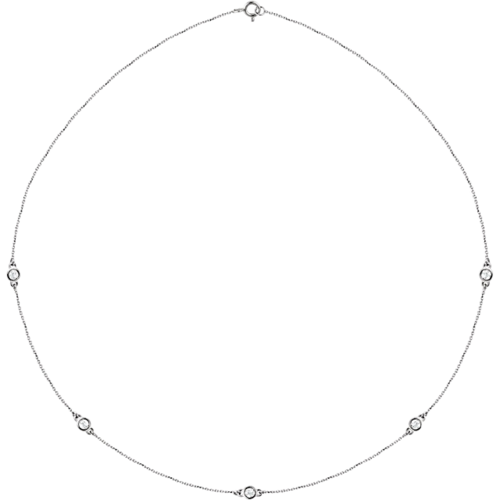 This beautiful diamond necklace holds a 1/6ct center diamond and measures 16 inches with a 2 inch extension. This necklace is available in 14k white, yellow, or rose gold. 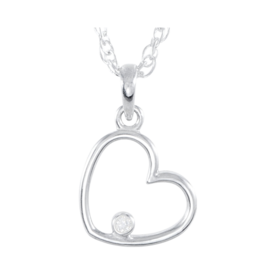 Lovely Diamond Heart Necklace. 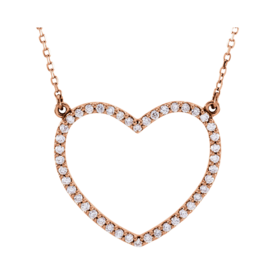 Romantic 14k gold heart necklace. This lovely design is available in 14k White or Yellow gold and set with 2 accent diamonds totaling .03ctw. Necklace is 18 inches and features diamond accented heart pendant measures 17mm across. Such a sweet necklace, perfect classic gift. 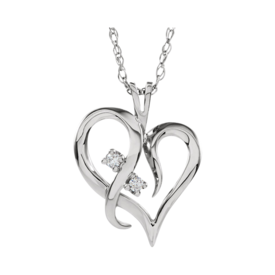 Romantic 14k Gold diamond heart necklace. Heart is available in 2 different sizes, an 18.75mm by 21mm and larger 25mm by 28mm selection. Necklace hangs at 16 inches. Diamonds total 1/3ctw in the 18.75mm choice and 1/2ctw on the larger 25mm necklace. 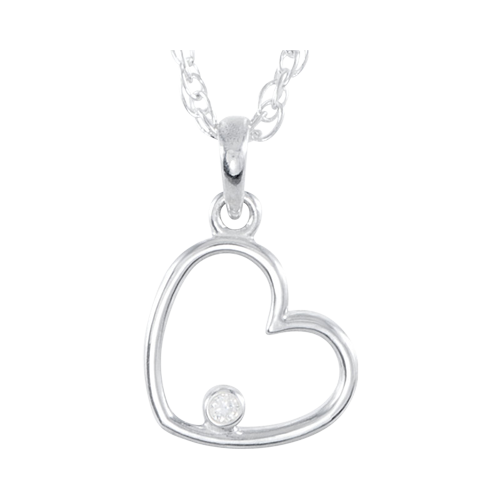 Diamond hearts are a perfect romantic gift. 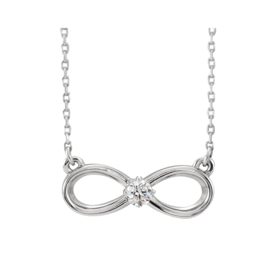 Delightful 14k White, Yellow, or Rose gold infinity inspired necklace. The focal point of this necklace measures 23mm in length by 9mm across. Diamond is a 1/6ctw and the necklace is 18 inches in length. 14k Gold Diamond 1/2ctw Halo style necklace. This diamond necklace is available in 14k white, yellow, or rose gold selections and also Platinum. (use our request link for Platinum pricing) Center diamond is 1/2ct I1 clarity G-H color stone. Accent diamonds are very dainty but add a little sparkle. This new classic design measures 16 inches in length. 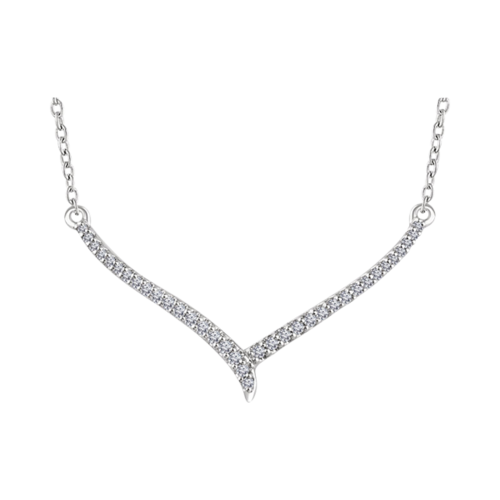 Beautiful 14k gold diamond "V" style necklace. 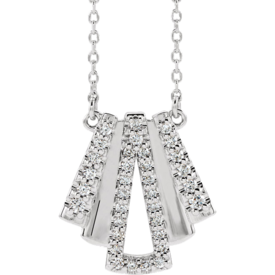 Diamonds total 1/6ctw in this necklace. Necklace measures 16-18 inches in length. Very stylish popular design. Dainty 14k gold diamond "Y" design necklace. This necklace measures 16-18 inches in length. Simple yet stylish necklace available in 14k white or yellow gold. Diamonds total 1/10ctw in this necklace. Infinity inspired 14k gold and diamond necklace. This delightful design is available in 14k White, Yellow, and Rose gold selections Also available in Platinum. Center diamond is a 3mm round 1/10 ct stone. Necklace is 18 inches in length. Simple, stylish necklace, perfect for anytime wear. 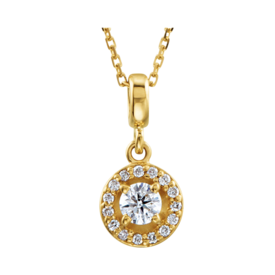 Stylish 14k gold diamond three stone necklace. 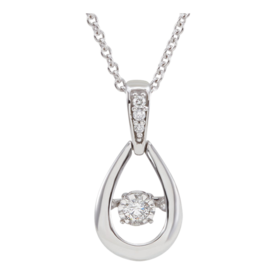 Diamonds total 1/3ctw with a 4mm round center accented either side with a 2.4-3mm round diamond. 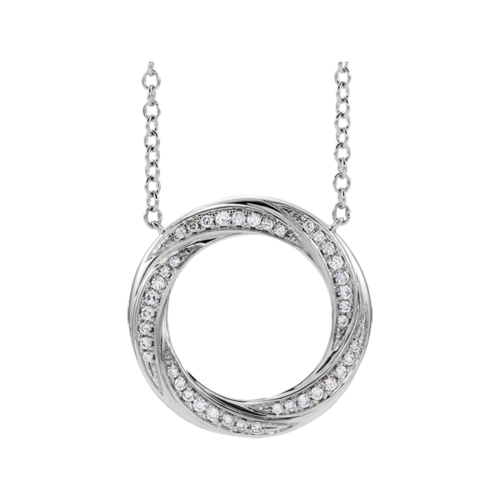 This necklace measures 18 inches in length with an option to wear it at 16 inches. Available in 14k White, Yellow, or Rose gold. Also in Platinum. 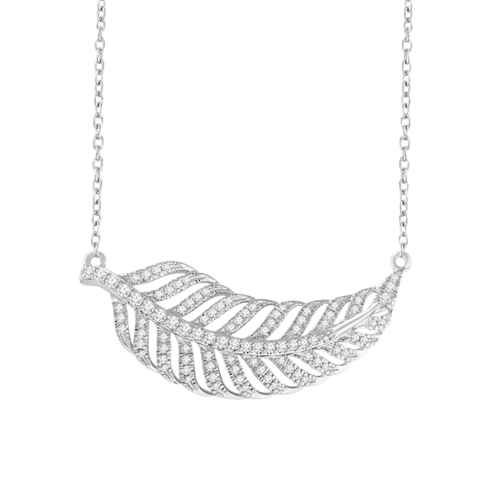 Nature inspired Diamond leaf necklace. This 14k White or Yellow gold diamond necklace design is set with 3/8ctw diamonds throughout the open leaf feature. Necklace measures 16 inches in length with a 2 inch extension to also wear at 18 inches. Leaf measures 13.5mm in length by 4mm wide. Pretty 14k gold graduated diamond necklace. This delightful design measures 16 or 18 inches long, features an adjustable length chain. Diamonds total 1/5ctw. Great necklace is available in 14k yellow gold, 14k white gold, or Platinum. Diamond Halo style necklace. 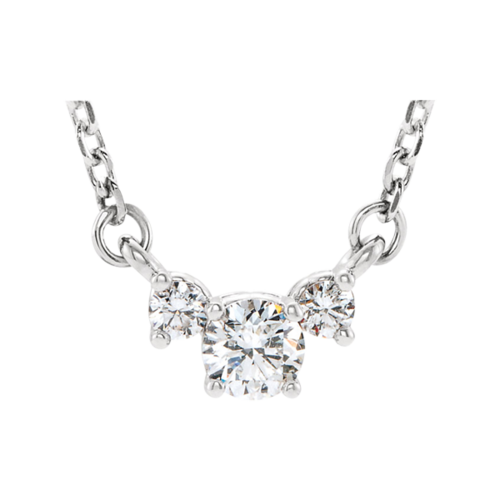 Stunning very stylish diamond necklace design features a 4mm center, diamonds total 1/4ctw in this necklace. Available in 14k Yellow or White gold, also 18kt choices. Necklace is 18 inches in length. This necklace speaks for itself in our video below. Pretty 14k gold side hanging diamond heart pendant. A single diamond is bezel set at the bottom of this 14kt gold heart to create a casual 18 inch length heart necklace. Available in 14k white gold, 14k yellow gold, and 14k rose gold options. Heart measures 15.2mm in length by 10mm across. Diamond is a petite accent at .02ctw. Pretty 14k White gold diamond Mystara ® is set with 1/6ctw diamonds. Center diamond shimmers and shines with any light with the slightest hint of movement. 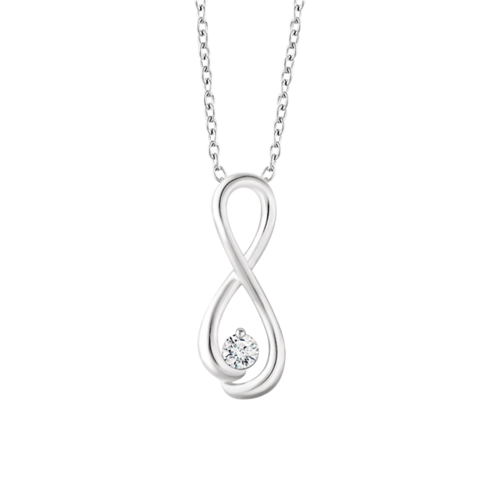 This exciting diamond necklace design was elegantly imagined and an exciting necklace you'll love to have in your jewelry box. Beautiful 14k gold diamond station necklace. Diamonds are in bezels and our price is for the 5 station design totaling 3/4ctw. This very popular style is available in additional sizes from 1/4 to 1 full carat. Each diamond is bezel set and this diamond necklace measures 18 inches. Order this in 14k yellow, white, or yellow gold. 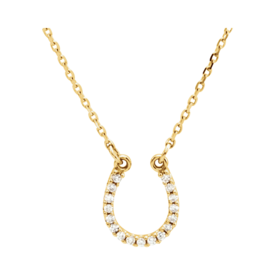 14k gold Diamond Horseshoe necklace. 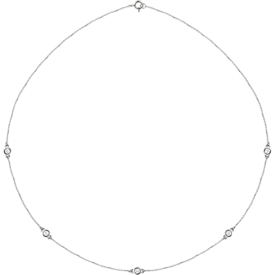 Dainty design is set with .08ctw diamonds and measures 16 inches in length. Horseshoe in th is design measures 8.7mm. A nice little necklace available in 14k yellow, white, or rose gold.